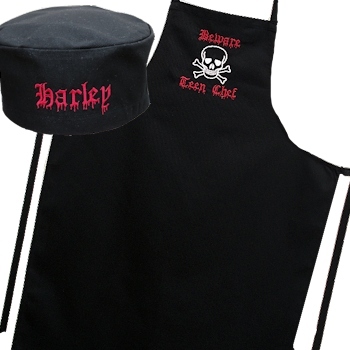 Black chefs hat and skull motif apron - teenage chefs will love the creepy theme! Teens and adults will think this gift set is just so cool. Teens and adults will think this gift set is just so cool. The creepy skull and cross bones motif adorns the apron and the embroidered text of your choice is sewn in a letter style called Blood of Dracula! Professional catering quality cotton drill apron and chefs skull cap, that is suitable for either cooking at home or indeed in commercial kitchens. Choose the thread colour you want for the wording on the apron and the name or initials on the skull cap. Our sample on the apron reads Beware - Teen Chef and on the chefs hat reads a single name. You type in the wording you want!